The Phoenix magazine is published quarterly - March, June, September and December. Annual subscriptions are $29.95 (25% off cover price) and two-year subscriptions are $49.95 (38% off cover price) for the printed version. The Premier Online Version of The Phoenix magazine allows instant access to an electronic version at a discounted rate of $19.95 for a one-year subscription. Plus, a back issue is included at no additional charge. Click here for more information. 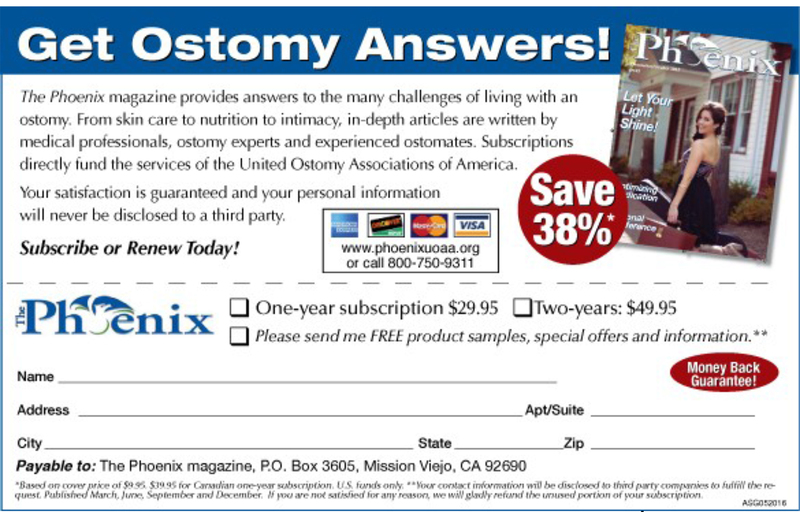 The Phoenix is the official publication of the United Ostomy Associations of America. Subscriptions are a major source of funding for the UOAA to help improve the quality of life of people who have, or will have, an intestinal or urinary diversion. Privacy Guarantee: Your contact information will never be given, rented or sold by subscribing. Each issue is mailed in a plain cover to insure privacy. Money Back Guarantee: If not completely satisfied, The Phoenix magazine will provide a refund for the unused portion of your subscription.